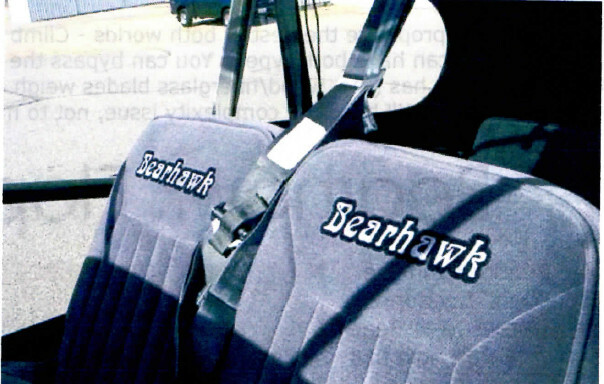 This is the story of "Smokey Bearhawk," Pat and Carol Fagan's homebuilt project. For as long as I can remember, I have wanted to build an airplane. A strange desire perhaps, since I never really messed with model planes as a kid. Plastic model planes never had enough parts for my tastes, so I always built model cars. The few flyable models I built never flew very well, which doesn't bode well for this endeavor. No manufactured airplanes ever caught my fancy. Carol and I spent years trying to figure out what kind of flying we really wanted to do, which is ultimately what determines what type of airplane to build. It was during my years flying air tankers that I realized I didn't really like flying as a means of getting from point A to point B so much. What was fun was flying low and sight seeing. The last major decision was whether to build from plans, or from a kit. With all of my "extensive" model experience I always assumed I would have to build from a kit, but the more I thought about it, the more I came to the conclusion that my burning desire was to BUILD an airplane, not ASSEMBLE one. Flying the finished product was a very secondary concern at this time. I really wanted to build, no matter how long it might take, and I figured it could take 10 years. I was concerned that assembling the plane in a year or two could leave the need to build unfulfilled. Can be built from plans. In 1996 we went to Oshkosh for the first time to "shop" for an airplane to build. While there, I attended a seminar on choosing a homebuilt aircraft. From that seminar I added one more criteria to my list: The design had to have at least 6 aircraft built and flying as a testament to the validity of the design. I saw the Bearhawk at Oshkosh that year, but didn't really consider it since only the prototype was flying. After Oshkosh, the Bearhawk kept drawing me back for its looks and utility, but there was always that nagging "only one flying" problem. It wasn't until I discovered, at my local EAA meeting, that another member, Russ Erb, was building one that I finally decided that there was enough support available for me to dive in too. I sent away for the plans and received plan set number 232 in November 1996. I bought my first roll of aluminum and started pounding out ribs in February 1997. I had prepared myself for the possibility that the project could take 10 years. That was the estimate I gave people so that they wouldn't keep bugging me about "is it done yet?" In reality, I hoped it would take only five years. I also expected that at some point, I would get tired of it and work on something else for a while. To my great surprise, that never happened. Every little milestone led to another aspect of the project that I just had to try. When I finally finished all the aluminum wing parts, I just had to start with the steel parts. Once all the wing parts were done I had to dive into their assembly. Once the wings were finished, I couldn't wait to start on the tail feathers. This led to the fuselage, then the engine, then covering, and the electrical, etc etc. I was totally hooked. By the time the fifth year passed I couldn't stop, even though I desperately wanted to. I wanted to get back to doing some of the things I usually do, travels with Carol, hiking, maintenance on the house and cars, but I couldn't tear myself away from the plane. After all, "it's almost done, just a little more and it will be finished." I have since learned what every builder knows, "it's never done." Six years and 4200 hours later, I made that first flight. I have long since gotten over the need to build and airplane. Now I just want to fly it. People ask me, "knowing what I know now, would I do it again?"